With Research on Stage (RoSt), KeKi contributes to the disclosure of ongoing and recently finalised research about children’s rights. Once a year, we give the floor to one or more researchers to present their work for a diverse audience. Using a methodology that is adapted to the project put on stage, the results and their relevance for policy and practice are analysed and shared. As such, RoSt contributes to the translation of theoretical, mostly academic research to the day-to-day working environment of children’s rights professionals. Dealing with interreligious diversity in the classroom can lead to many questions, misunderstandings, taboos and in some cases conflict. But it can also lead to enrichment for pupils and teachers. How do we get the best out of a diverse classroom? And how can class diversity be a stepping stone to internalising a democratic attitude of criticial citizenship? These questions were central to KeKi's Research on Stage 2017. Researchers Lore Van Prague (UAntwerp, Ghent University) and Goedroen Juchtmans (KU Leuven) presented the stories of pupils they interviewed in various primary and secondary schools. How do young people integrate the various worldviews with which they grow up into their identity? Which attitudes of parents and teachers lead to conflict for them? And what role does having a different worldview play in their perception of their educational path? After that, Johan Lievens and Jonas Vernimmen (KULeuven) discussed a number of legal issues about freedom of religion in education in greater depth. Is banning the headscarf banned on the playground in accordance with the constitution? Is it permissible for non-subsidised schools to remove the theory of evolution from the curriculum? Do children with a non-Christian religion have the right to their own religious holidays? Can the hours of religion be filled in by another course? As a result of this Research on Stage, we also issued a policy advisory report on our own initiative about digital media and children's rights. (only available in Dutch) Based on scientific findings, the assumed general consensus of the child in need of protection is challenged. The policy advisory report gives rise to 11 policy recommendations. How can we hear the children and youngsters in juvenile court? How can we adapt our social practice to fundamental rights? How do we handle personal files, now and in the future? Do we have to separate the approaches towards children with a problematic situation in their home from those who commited a criminal act? Does our current practice of judging young people in front of an adult criminal court correspond with children's rights? The event took place in Brussels on October 8th, 2015. All background materials (abstracts of the researchs, the reports of the debating groups and the analysis) can be consulted on our Flemish page. The first Research on Stage presented a project on suicide among children and adolescents, prepared by the Unit for Suicide Research of Ghent University, and commissioned by the Flemish Child Helpline ‘Awel’. 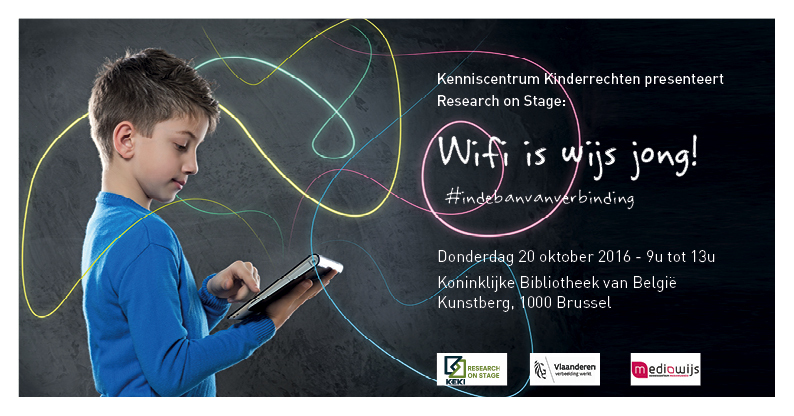 The event took place in Brussels on October 9th, 2014. All background materials (including the research report, the presentations, records of the different roundtables and an umbrella summary report) can be consulted on our Flemish webpage. The RoSt photo album is accessible via the KeKi facebook page. Put your research on stage!